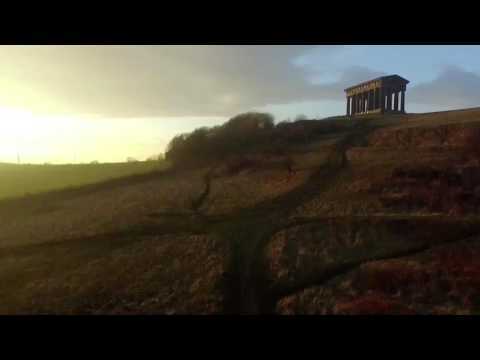 The Earl of Durham's Monument, better known as the Penshaw Monument, was built in 1844 on Penshaw Hill. 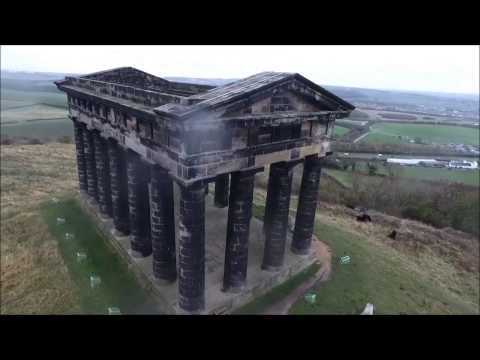 The folly is a 70 ft high replica of the Temple of Hephaestus in Athens, but twice the size of the original. 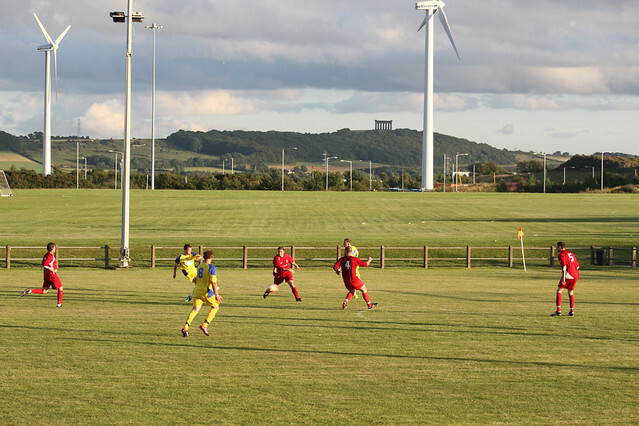 It can be seen for miles around and its image appears on the badge of Sunderland Association Football Club. 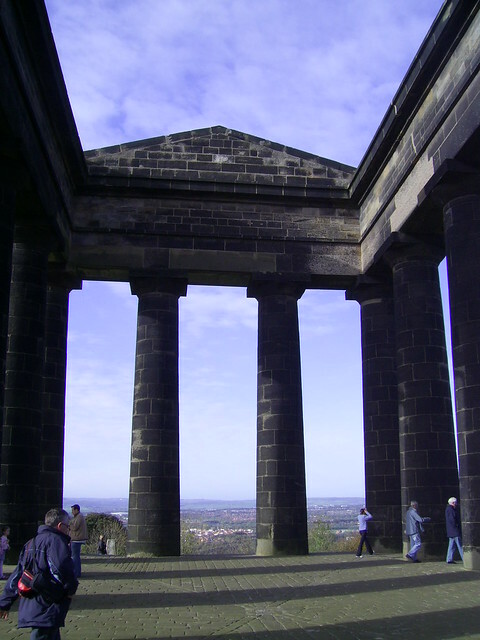 The monument was built in memory of John George Lambton, first Earl of Durham (1792-1840). The foundation stone was laid by the Marquess of Zetland on the 28th August 1844, 4 years after the death of the Earl. 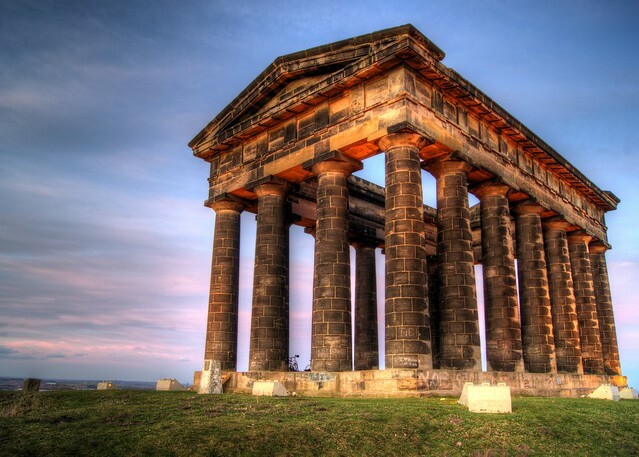 The architects were John and Benjamin Green of Newcastle, and the builder was Thomas Pratt of Sunderland. 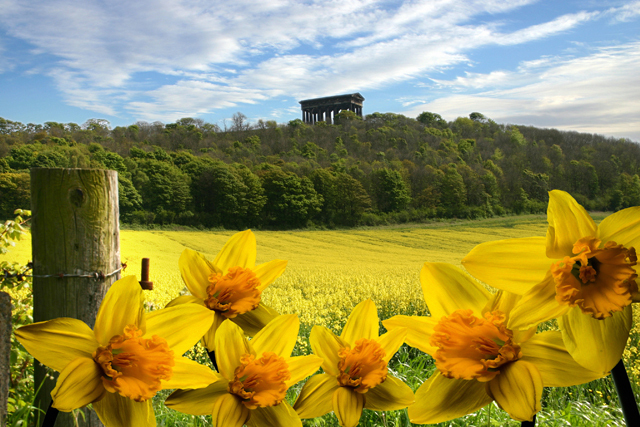 It is located near Penshaw and about 2.5 miles north of Houghton-le-Spring. 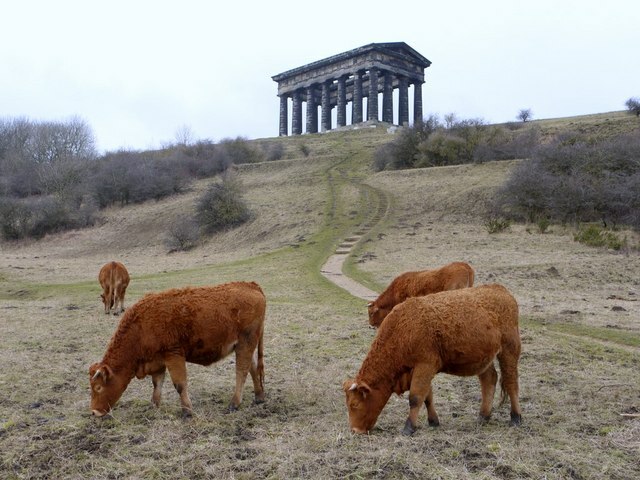 The monument is Grade I listed and cared for by the National Trust. 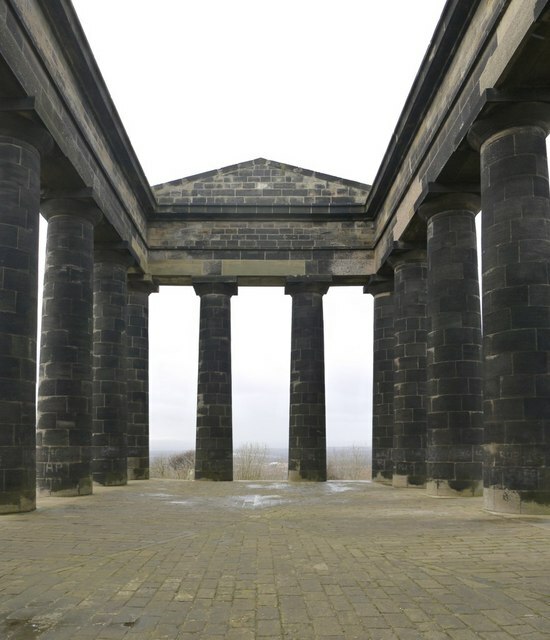 Penshaw Monument , officially The Earl of Durham's Monument, is a folly built in 1844 on Penshaw Hill between the districts of Washington and Houghton-le-Spring, within the City of Sunderland, North East England. It is dedicated to John Lambton (1792–1840), 1st Earl of Durham and the first Governor of the Province of Canada. The hill on which the monument stands was presented by Charles Vane, 3rd Marquess of Londonderry. 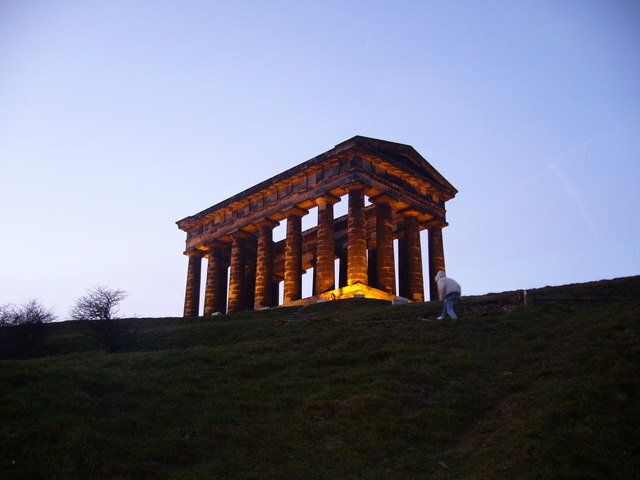 The monument dominates the local landscape as a half-sized replica of the Temple of Hephaestus in Athens. It is floodlit at night. 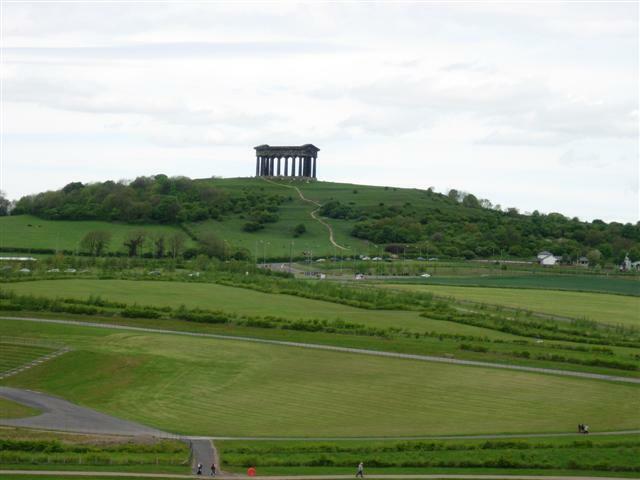 Although often called "Penshaw Monument", the correct title of the structure is The Earl of Durham's Monument. 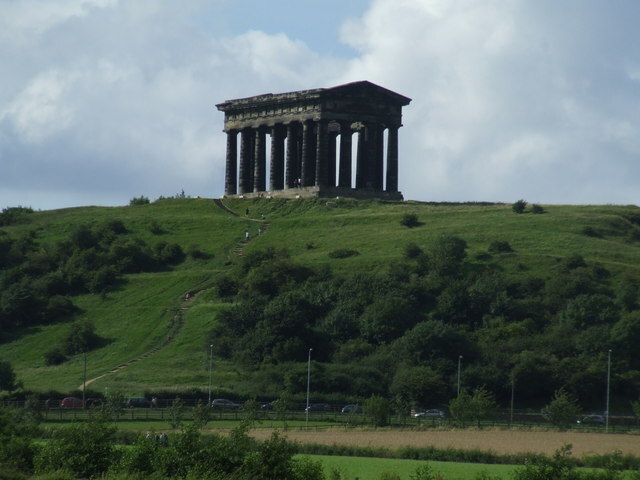 The monument stands on Penshaw Hill, the name of which is derived from a mixture of Celtic and Anglo-Saxon words. Pen is a Brythonic or Cumbric word for hill, as in the name Penrith; shaw is derived from sceaga meaning "wooded area"; and finally the Old/Middle/Modern English word "hill". The name thus means "wooded-hill hill". 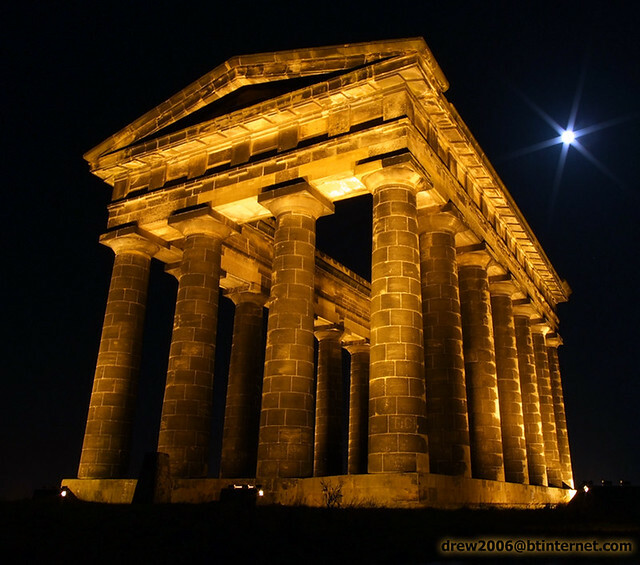 The Doric tetrastyle monument is long, wide and high. The columns are each in diameter. 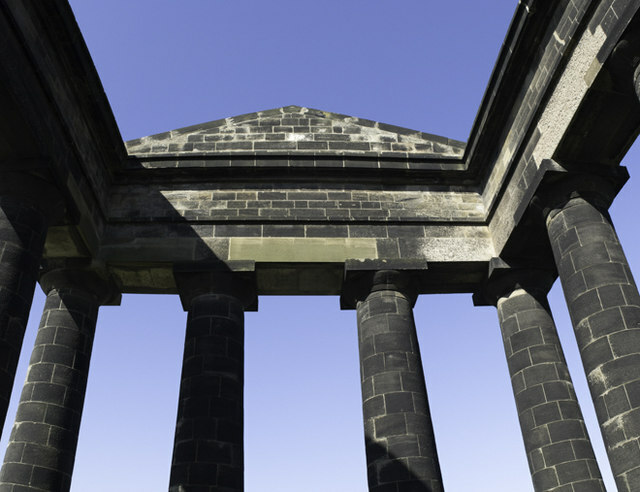 It was designed by John and Benjamin Green and built by Thomas Pratt of Sunderland, based on the Doric order. 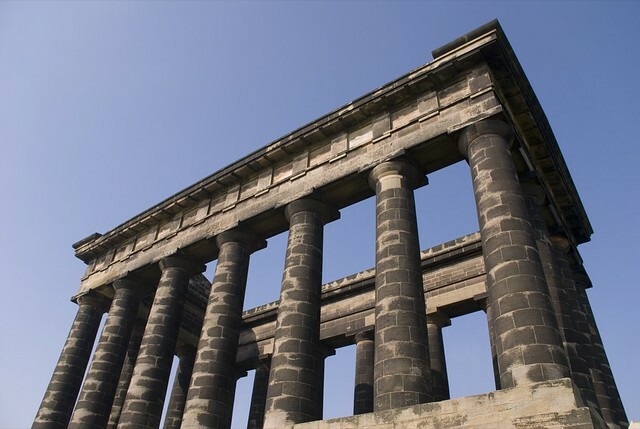 Resting on the columns is the entablature which itself can be split into three main parts. The architrave, the main spanning beam across the tops of the pillars. Above the architrave is the frieze, the central patterned section. Then the cornice is the upper part which projects outwards. Finally, the pediments are the triangular facings at each end of the Monument. One of the pillars contains a spiral staircase to a walkway around the top of the monument. 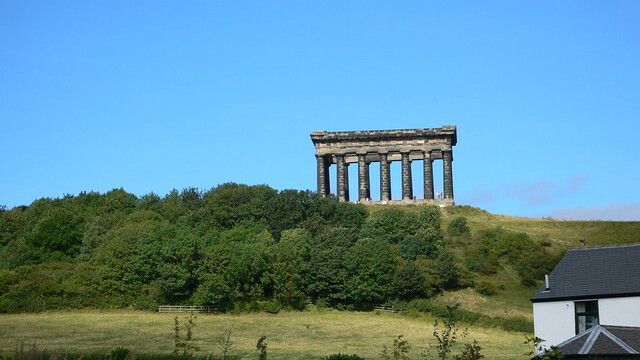 The Monument is made of gritstone from the Marquess of Londonderry's quarries on the east coast. Steel pins and brackets were used to hold the stone blocks in place. 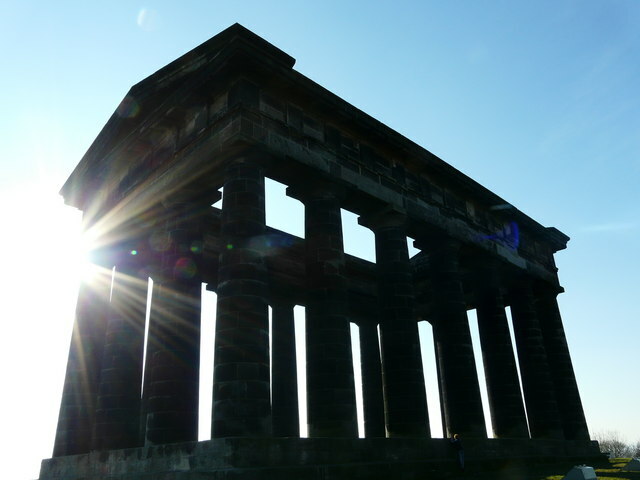 On Easter Monday 1926 a 15-year-old boy, Temperley Arthur Scott, fell to his death from the top of Penshaw Monument. The boy was with three friends and 20 other people when the accident happened. They had reached the roof via the spiral staircase in one of the pillars. Witnesses said that the boys went round the roof walkway twice before deciding to make a third circuit. However Scott fell trying to avoid the other visitors by passing around an open end where there was no protecting wall. 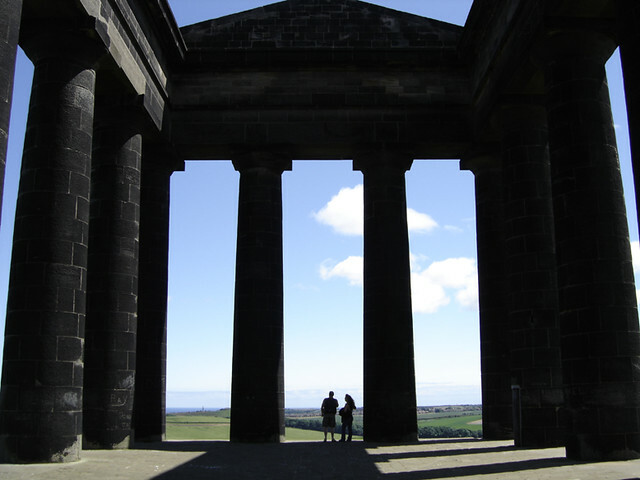 Afterwards the spiral staircase to the roof was closed and remained so until a special opening on 29 August 2011, when the public were granted access to the spiral staircase and views from the top of the monument. This was an initial test to see if it was popular enough to open again for future one-off days. The National Trust did not take bookings, the public simply turned up on the day. It was so popular (more than 2,000 people) that not all those who turned up were able to go to the top of the monument and many were forced to leave their contact details to be given priority on the next open days. Access to the top is now available every weekend between Good Friday and the end of September. Bookings are taken via the National Trust website. The cost is £5 per person or free to National Trust members. 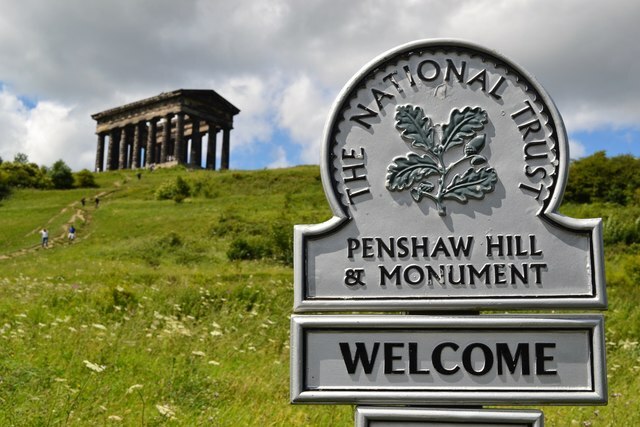 In September 1939 John Lambton, 5th Earl of Durham gave Penshaw Monument to the National Trust. 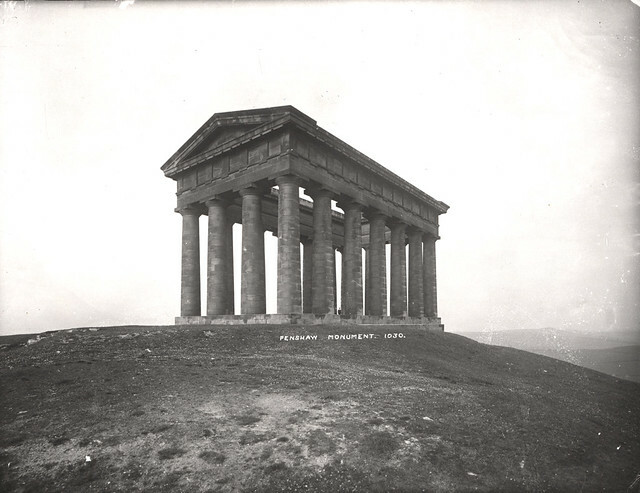 Owing to settlement as a result of mining beneath the hill, Penshaw Monument was underpinned in 1978. The next year the entire western end was dismantled block by block in order that damaged lintels could be replaced by new reinforced concrete ones. 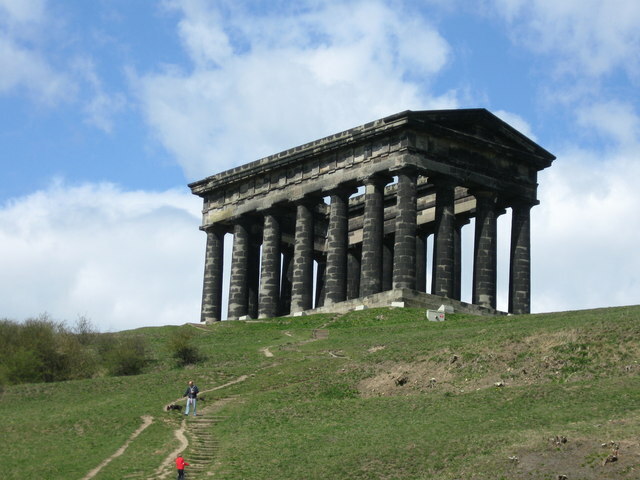 Penshaw Monument features on the club badge of Sunderland A.F.C. 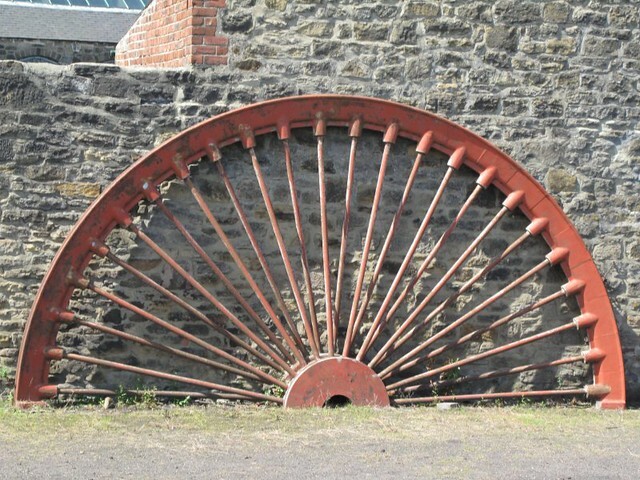 It was acquired by the National Trust as a gift from the 5th Earl of Durham in 1939. 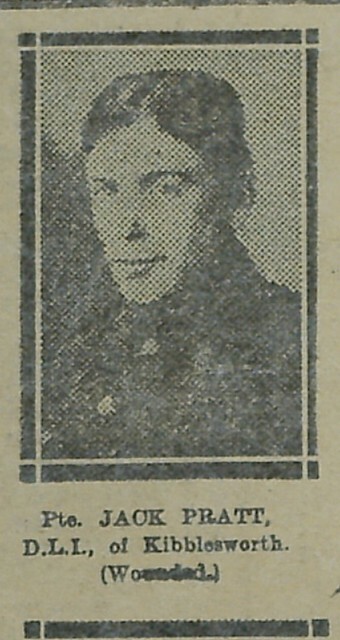 A placard was placed on the front of the monument to recognise this. Text from Wikipedia, available under the Creative Commons Attribution-ShareAlike License (accessed: 03/04/2016). 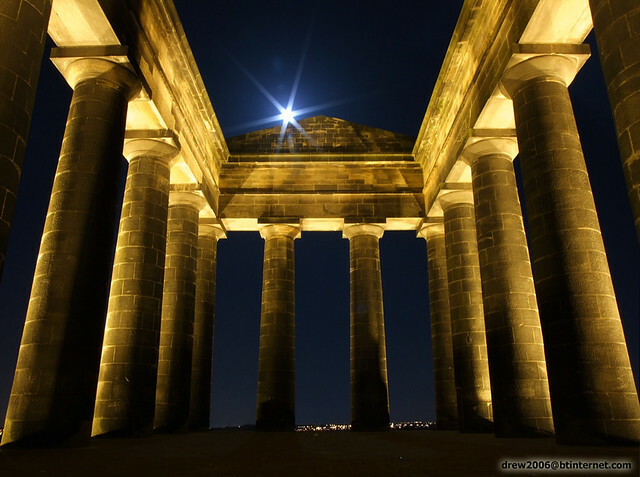 Visit the page: Penshaw Monument for references and further details. You can contribute to this article on Wikipedia.